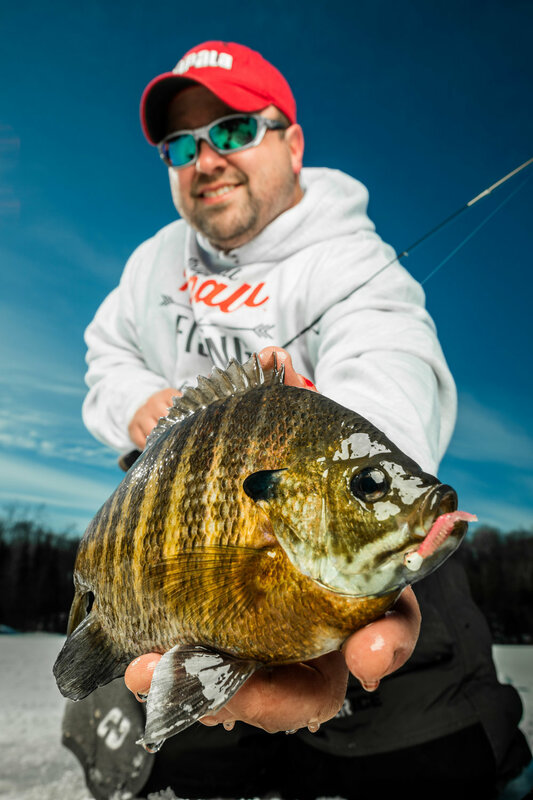 What are your go to jigs and plastics for panfish throughout the ice season? Hi Neil – This is a tough question, as there are many baits I’ll use over the course of a winter in different situations. Sometimes, it’s a matter of catching a few and seeing what they’re coughing up, or other times, my selection is based solely on size and color of the bait, especially when clarity is poor. Still, I’m just like other anglers, where I have my own bias when it comes to tendencies and go-to’s. I’ll detail a few that are clear winners no matter where I’ve gone. · Tungsten Tubby – 1/16 oz and 1/32 oz – Pair up sizes with confidence colors of your own, but no matter where I go, this is typically the #1 jig I use as the backbone of the presentation. It hangs more at a 45 degree angle, yet dances horizontally much like a minnow. The head-up and tail-down presentation works well, as I’ve seen many fish on underwater camera comfortable in approaching it from below. · Waxy Jig – This bait gets little outward press, but is the best vertical presentation I show to panfish annually. I love mixing it up and giving them a bait that hangs differently. Those small details are often what helps you in turning a good day into a great day. · Mustache Worm – I’ve been a huge fan of this design since its inception. I run twin tails for crappies, and pull one off for most bluegill situations, but I can rig these things in incredible variations. I prefer the bigger ones for gills and crappies both, and really appreciate the flexibility it gives any presentation. · Wax Tail – This is a great design when grubs are the order of the day. Often, when friends are doing well on bait, I can do as well or better with this plastic, as it has the bulk needed on the hook shank with some attracting movement in the tail-section. The biggest sizes on any jig are great for trophy crappies! · Nymph – This is a quality design for the big waters where mayfly’s are present. Perch love these things, especially in the buggy colors, but also in the white and glow colors at night. When you’re catching perch that are spitting up bugs all around the hole, this is a go-to. Here’s a few plastics I’ve run with some success thus far, but I’m going to be doing more testing on them this year. 2017 VMC Tungsten Lineup – I’ve used the Probe Jig as a bloodworm imitator with some success for gills fishing it right on bottom, and I’m super intrigued with the Crayfish Jig for all kinds of applications, especially perch and even walleye. This season will be another fun winter of experimenting to see what the new baits can do and how they stack up to time-honored and true favorites! What Kind of Line for Panfish and Walleyes? What is Trophic Status, and How Does It Affect Fishing?